Triangle Collision is a member of the Assured Performance Network. We have the equipment and factory trained technicians needed to repair any model Jeep to pre-accident condition. If you live in the Morrisville or Cary area and have a Jeep that was involved in an accident, contact Triangle Collision at (919) 460-7693 or fill out our form! We understand that your Jeep is a significant investment, and are confident that you will be satisfied with the quality of our service. We offer Lifetime Warranties for our repairs and paint services. This way you can rest assured that your vehicle will be repaired to pre-accident condition. .
You need to know that your Jeep has been properly restored. 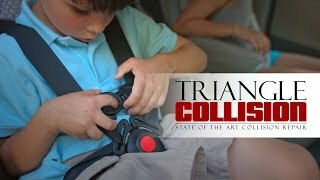 With Triangle Collision you will be kept up to date during the repair process so that you can understand what our technicians are doing and why. There are many questions that go through your mind after experiencing an accident. We do not want the quality of the work to be among them. It’s your choice, not the insurance companies, where your vehicle is repaired. Choose Triangle Collision, the Cary, NC area’s premiere Jeep Body Shop & Collision Center. As a body shop our top priority is getting you back on the road safely. This is one more reason why our factory trained technicians always follow the Jeep approved repair procedures for every repair. BASF technologies are manufacturer approved to restore the aesthetic value of your Jeep. Not only will your vehicle look as good as new, but our technologies can help preserve the value of your vehicle. We are partnered with Lemon’s Wrecker Services so that our customers never have to worry about being stranded. Through our partnership we can more easily cover the cost of transport under the insurance claim. Their towing is available 24/7 and can transport any sort of vehicle. Let us take the stress of dealing with the insurance company off of your hands. We understand the claims process and will work with the insurance company to get your Jeep back to pre-accident condition.